Here is my finished LBT. This is the most complicated knit that I have completed. I felt confident doing it, but as opposed to most of my other knits, I really had to pay close attention, especially during the lace sections. 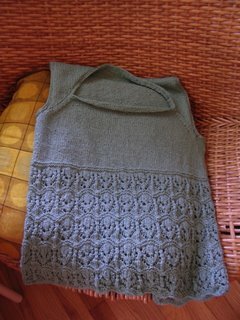 I still need to block the tank (I lightly steam blocked it pre-finishing) and take some pics with me in it. I used the SWTC Bamboo in the pattern color. This is quite rare for me since I usually both knit with and wear oranges, reds, and browns. However, I liked the color and wanted to switch up my wardrobe a bit. One Question: The front doesn't roll quite as much when it is on, but it still has a rolling problem. I think I bound off too loosely. Does anyone have any suggestions on ways to keep it from rolling? hey, yours came out beautiful! i was thinking of actually sewing the sides of the front where it meets the corner of the raglan decreases inward a little if rolling became a problem for me - that's my suggestion.